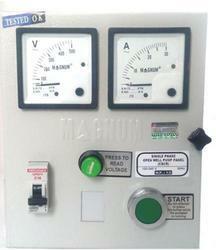 Magnum Manual Single Phase Submersible Pump Panel Compact is a powerful controlling device for your submersible pump made with heavy duty Capacitors, which protects the pump from hazards caused due to over-current. Magnum Manual Single Phase Submersible Pump Panel Compact is a powerful controlling device for your submersible pump made with heavy duty components, which protects the pump from hazards caused due to over-current. Fitted Run & Start Capacitors for starting and running torque in both running and starting condition of motor.